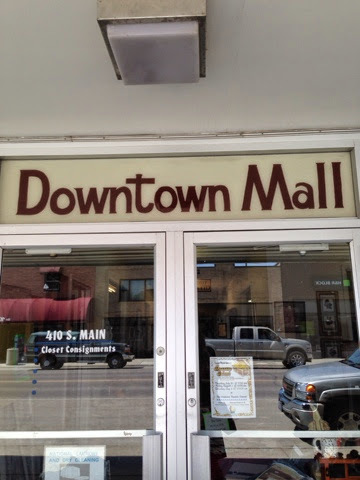 We left off in Helena and the next day, after a relaxing stay at the Helena Taj-mawalmart, we carried on to Bozeman, Montana, and a local thrift store called Sacks. Sacks provides financial support to the Sexual Assault Counseling Center. A good cause and they concur with me about dresses! Stylish? 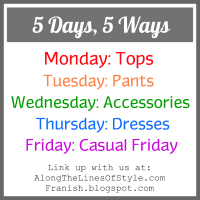 Trendy? Forget it, "happenin" is where it's at! Some sunnies are just too big. 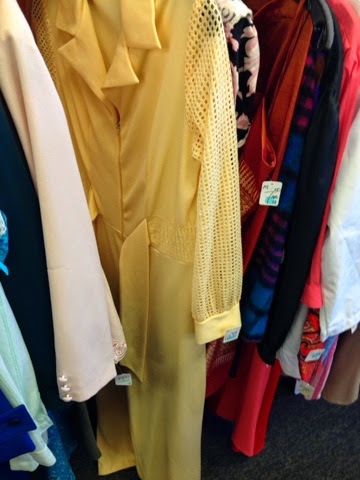 They had a good vintage section that had me ponderin whether this yellow jumpsuit would be considered happenin. 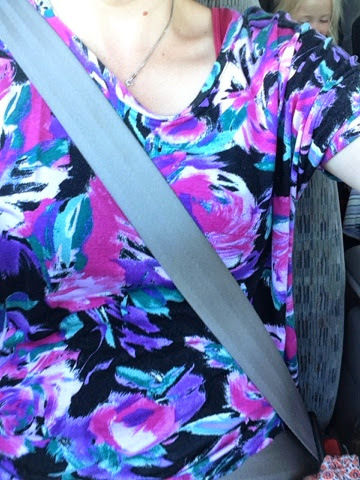 I found one pretty top for $2 then realized I had no American cash. :( Goodbye pretty top. 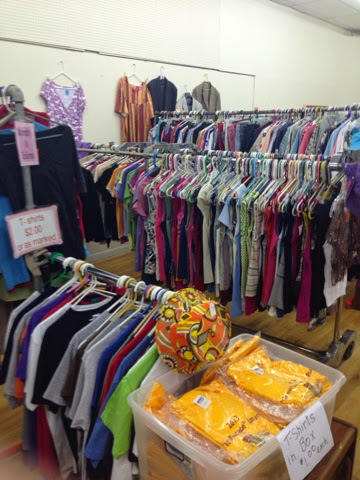 Next stop was another local thrift store down the road in Livingston. 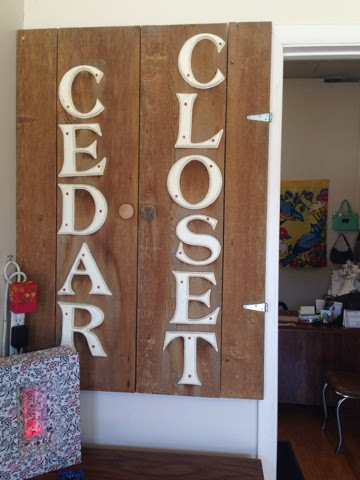 The Community Closet was AWESOME! 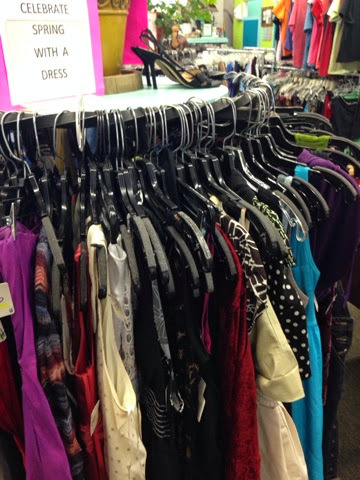 Pants for $2.50, dresses for $3, friendly staff and a fitting room with a bathmat on the floor! 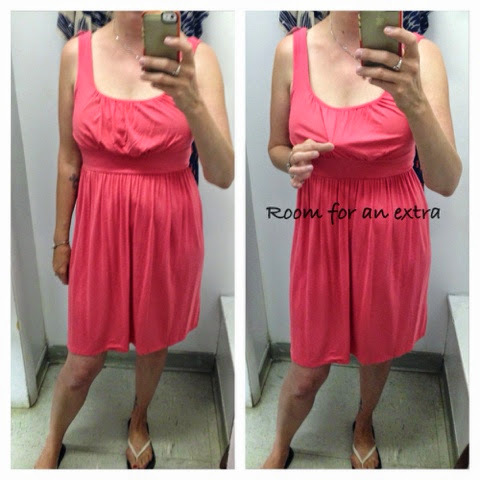 (These small thrift stores have the most interesting fitting rooms!). Then another tragedy occurred! My phone died! From 35% to dead in a second! I don't understand what happened but it meant I didn't capture my finds OR get a selfie with John Mayer who happened to be standing on the streets of Livingston! Sigh. 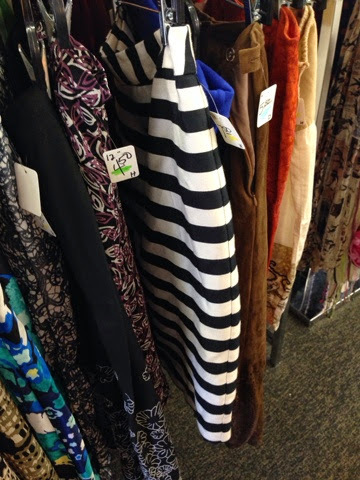 We enjoyed Yellowstone in all its natural no-service glory and on our way back stopped at the Goodwill in Great Falls. 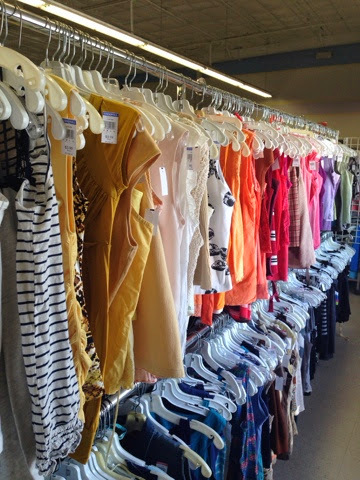 I like how Goodwill arranges their stock by colour. It's like an inviting rainbow! 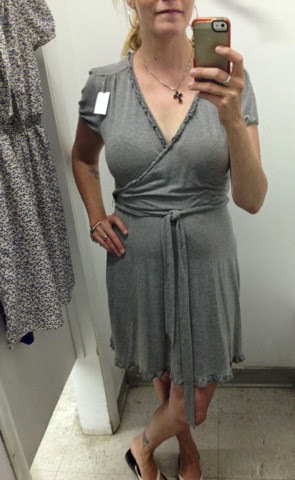 Gray jersey wrap dress for $2? Yes please! Nice colour, nice fabric but what the what is with all the bunchy fabric in the middle? 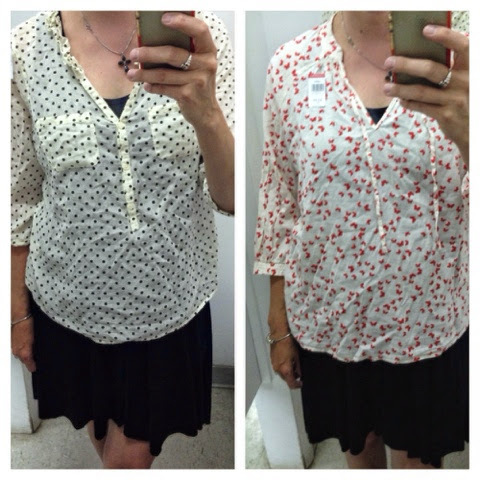 These light cotton Old Navy tops are perfect for those of us prone to shoulder sunburns on hot days. I only got one - any guesses which one?! 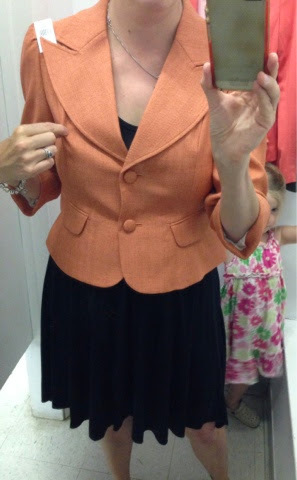 This perfect-condition blazer was labeled a petite but I thought it might work as a cropped blazer... The tailoring told me otherwise! And it did! And I think it's vintage! And it's wool! And it was TWO DOLLARS! That score was a hard act to follow, but I was willing to give it a go, so I headed to a secondhand not-exactly-consignment shop. 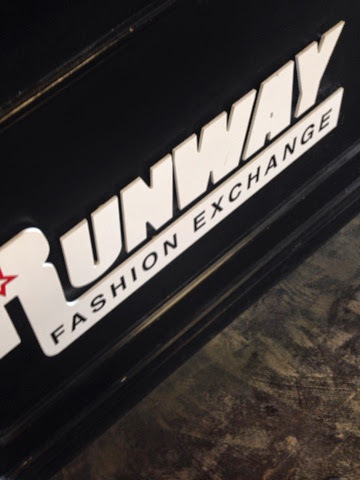 You bring in your clothes and get cash on the spot! 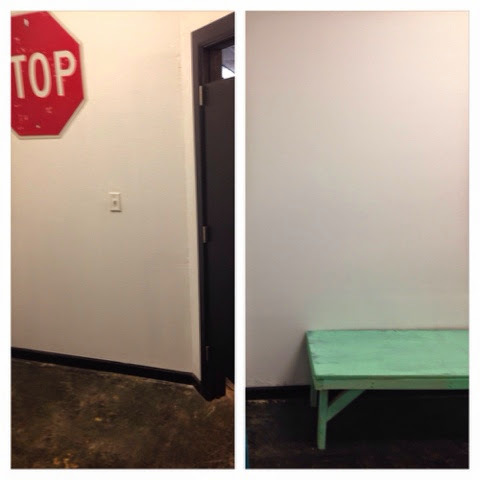 It had a massive fitting room, though I don't think "stop" induces the right shopping message. 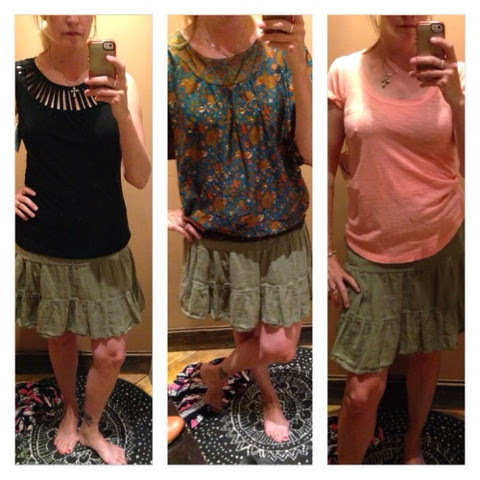 Luckily I outsmarted the fitting room signage and found plenty to try. These beauties were both a smidgen too big despite my road-trip snacking and camping imbibing (what I consider to be my camping-survival instinct). 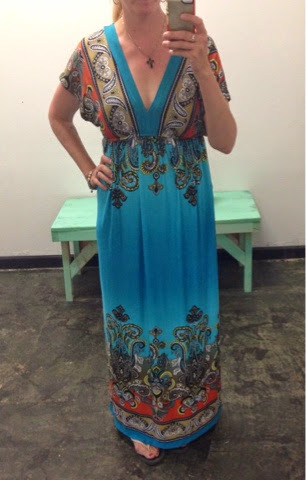 This dress fit but reminded me of Mrs. Roper. Why do I keep doing this to myself? 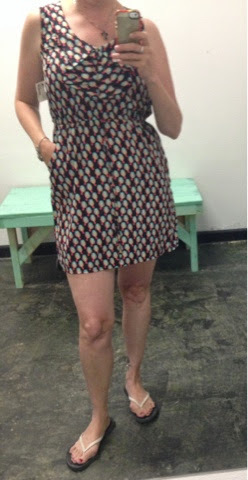 This short dress belongs on someone who doesn't know who Mrs. Roper is. 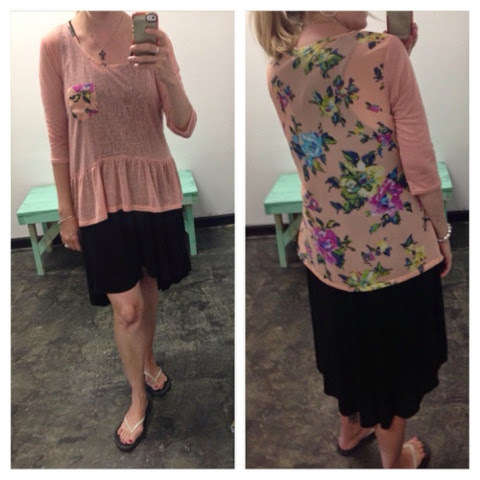 I liked this pretty top but noticed a small hole which means my other thrifted tops would budge it right out of the wearing rotation. 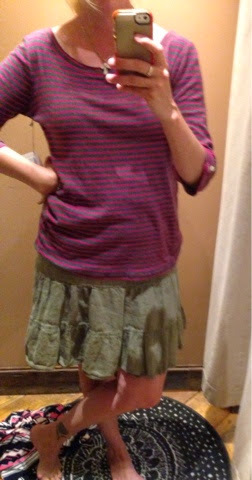 I ended up snagging this skirt at the last minute because I'm fresh out. 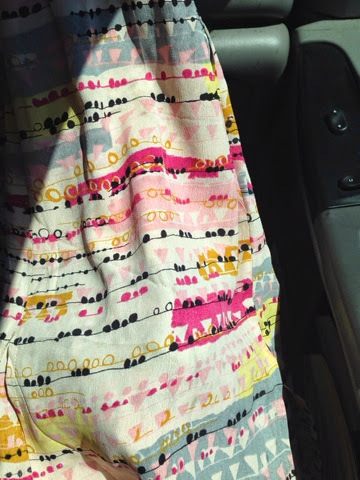 Pink, gray, mustard - obviously it was meant for me. 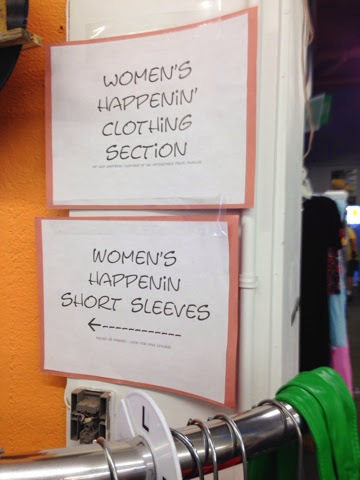 Yep, it's a thrift store alright but are there any clothes? Score!! 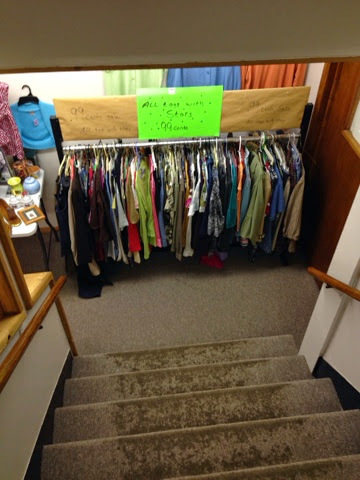 99 cent rack at the bottom of the stairs in the back! A little treasure chest! 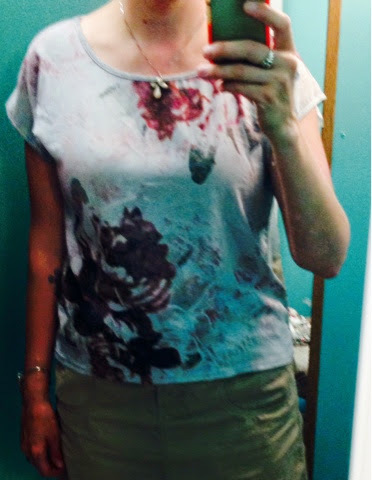 I scored a few pieces including this light cotton floral pretty top. 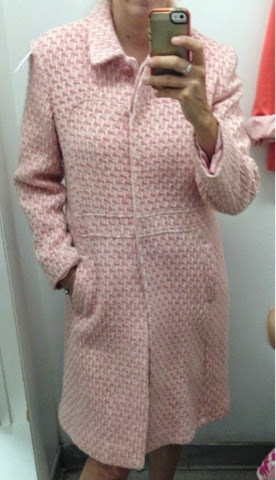 Not sure if this beats a wool winter coat for $2 though! 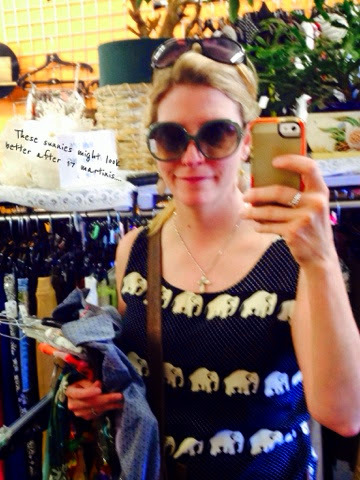 I got all excited about little local thrift stores at this point and made my family stop in the next town, Shelby. 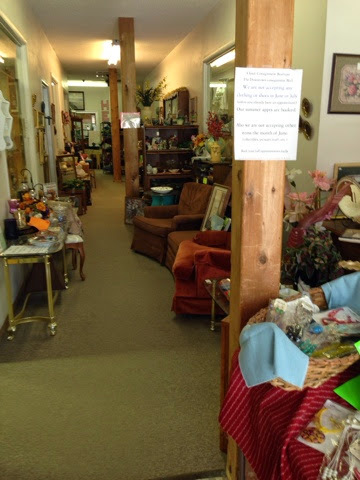 This was a true thrift store and had a bit of everything including a box of free Bibles ("We don't charge for Bibles"). I almost bought this for Megan Voss. And I had a good chat with the owner and it turns out we missed the town fair by a day! Darnitall! 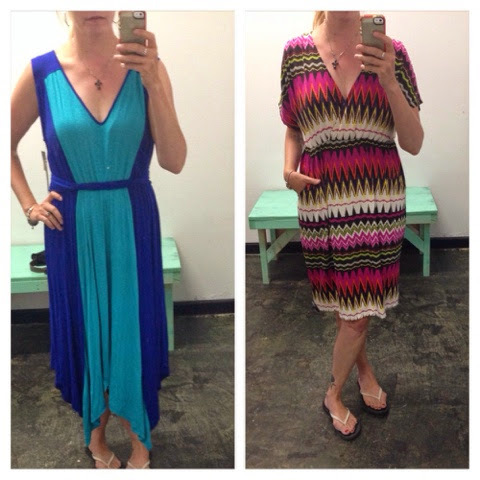 My cousin Cory tipped me off to this boutique in Olds and I'm glad she did! What a lovely store! 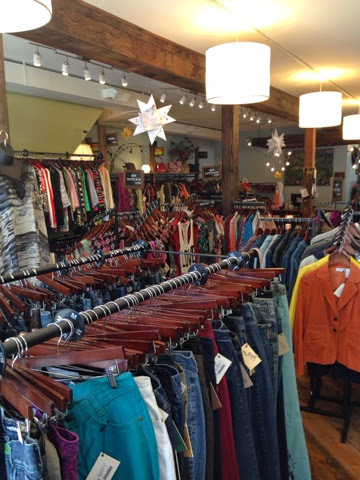 It's consignment but the prices are very reasonable, the selection is impressive and the pieces are in perfect condition. No bathmat in this fitting room! 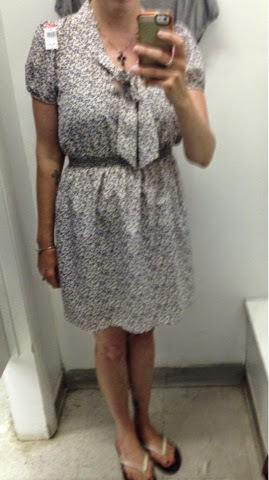 Just me in denial about short dresses again. I have been looking for an olive skirt and thought I wanted a pencil skirt but this Gap one had a cool summer vibe that worked with all the tops. 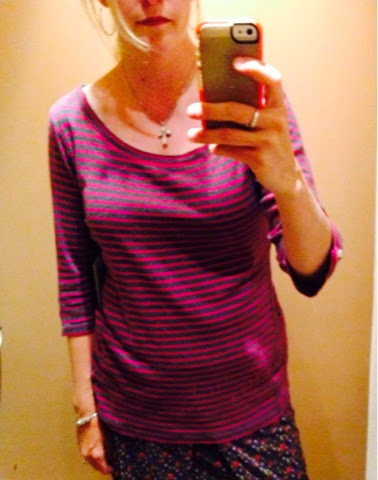 This pink striped banana republic tee had my name on it. If these were a bit lower they'd be riding home with me as we speak. Sigh. 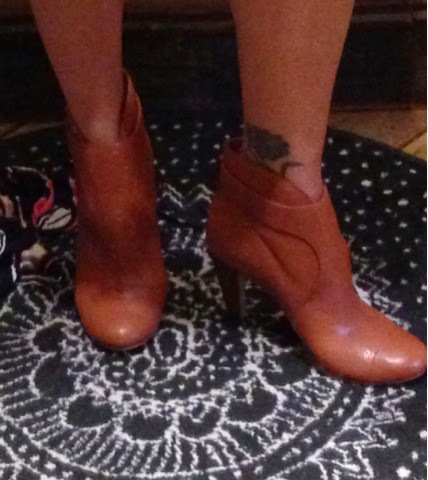 I ended up taking home these two pieces and might just wear them tomorrow. 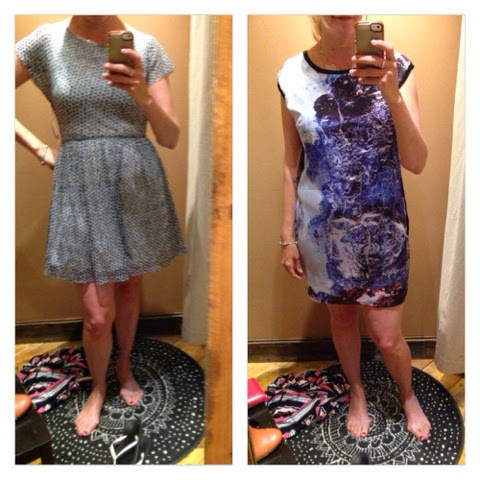 Because I'm like a 12-year-old with waiting to wear new clothes. 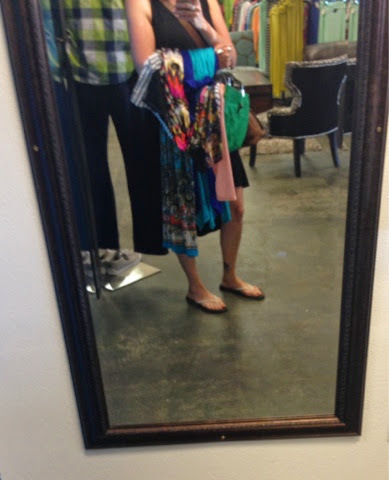 I wish I had more time to shop at reFined. I would definitely recommend you stop in if you're passing by Olds! 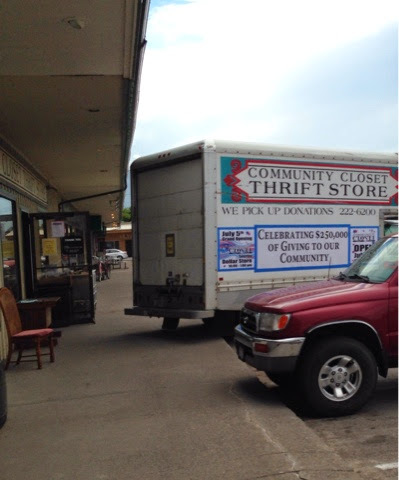 That my friends wraps up my July road trip thrift shopping adventures! 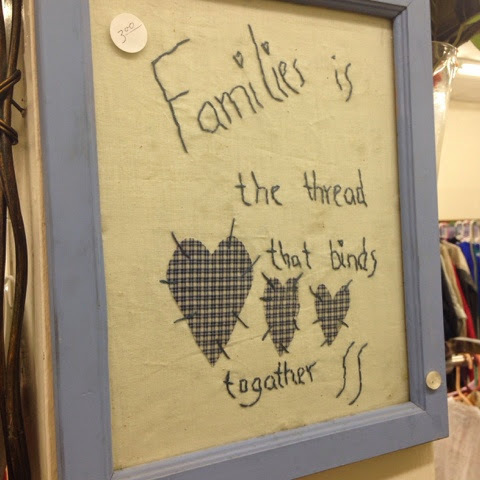 My family is nearly home and I have a mountain of laundry that ought to keep me busy until next Saturday - the July 19 Value Village Shop Hop! 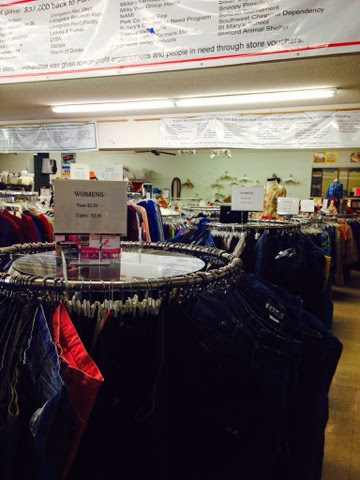 Any other Alberta thrift shops that would be worthy of a mini road trip?! 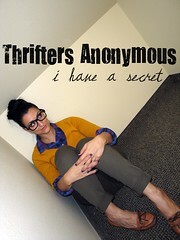 I had so much fun, I can't wait to hit the thrifting road again! My pleasure! 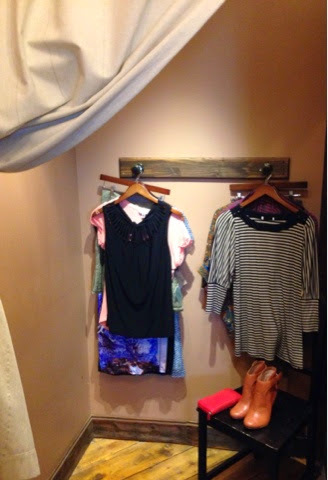 It's a great boutique, I will be back! 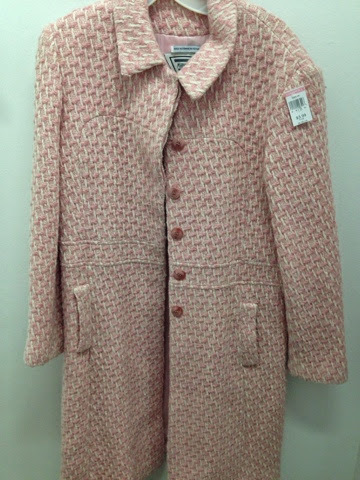 I used to work at Urban Thrift in Calgary (3434 34 Avenue). It had a different owner at the time, but they quality and price was amazing. I always had people ask me where I got this or that, "At my thift store," I would reply. It's been a few years since I was back, and I have heard it isn't quite what it used to be, but it's better than any Edmonton store I've ever been to! I would love to check this Olds store out. Thanks for the tip! Thanks for YOUR tip! I will look it up next time I'm in Calgary! 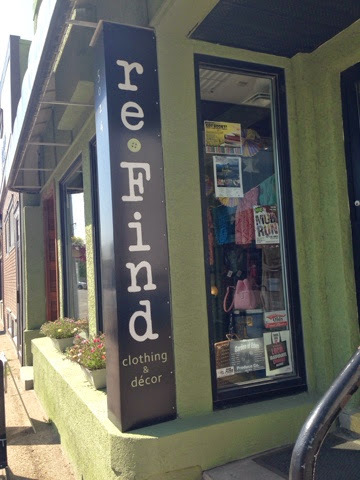 And definitely stop by reFind - such a lovely store! Wish I had more time there!